Micromax A25 Smarty dual SIM smart phone is one of the new releases from Micromax which runs an Android 2.3.6 Gingerbread platform. According to Micromax official Web store, the smart phone is priced Rs. 3999 in India. Micromax A25 Smarty dual SIM smart phone is powered by 1 GHz single core processor. 3G connectivity is not available in the handset and only supports EDGE. 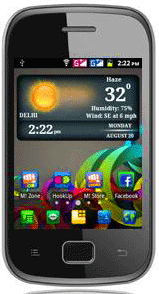 Micromax A25 Smarty comes with 2.8 inch (7.1 cm) TFT touch screen display with 240 x 320 pixels resolution. The phone has 256 MB Random Access Memory (RAM) and 512 MB Read Only Memory (ROM). 120 MB user memory of the handset can be expanded. There is a memory extension slot which supports 32 GB memory via micro SD cards. Micromax A25 Smarty dual SIM smart phone comes with 1.3 MP rear camera with fixed focus which capable for an average video capturing. The phone has a Standard Li-Ion 1280 mAh battery which provides 4 hours talk time and 180 hours standby time. Micromax’s Hookup Instant messaging application is also available in the handset. Advanced connectivity options like Wi-Fi, Bluetooth, GPRS, WLAN and micro USB are enable the phone. Micromax A25 Smarty dual SIM smart phone is available in black.